About me? Boring, but here I go.... Fourth generation full blooded Gig Harbor Croatian. My family has lived in Gig Harbor for over 100 years. Arnie and I married 28 years ago and have four wonderful children. I grew up in a football family. My brothers played since they were in grade school on up to college. My brother John Karamatic was even an all-state WR while playing for GHHS. My Dad coached peewee in Tacoma, played semi-pro and I even cheered for the Peninsula Seahawks football team. My son Brendan just graduated from Eastern Oregon University attending on football and academic scholarships. He was a four year starter & four year all-academic athlete. Football is in my blood. I started sports photography when my oldest son Antone was playing on the little league all-star team. Parents in general scared me and I found behind a camera was a good place to hide. Over the years my skills increased & in 2008 went professional working for the GHHS Football program and Peninsula Youth Football League. I am starting my 11th season with Gig Harbor High School Football, 7th season with Peninsula Youth Football. 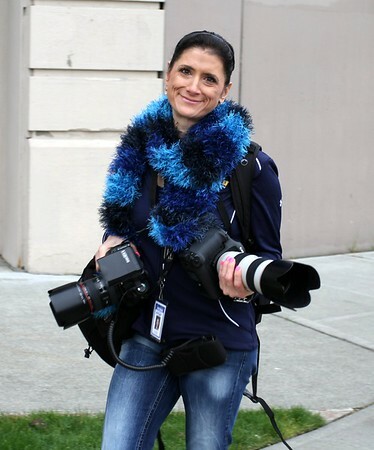 I also cover all sports at Gig Harbor High school as a WPA Network staff photographer, cover local marathons for On The Run Events and work for numerous other sports teams in our local area. I owe a special thank you to the pros who mentored me and the coaches who allowed me to hone and learn my sports photography skills. Anyone can buy a camera and call themselves a pro, but I pride myself in the years of hard work & studying I’ve done. It’s 100% necessary to shoot sports professionally. Over the last few years my work has been published in magazines, national recruiting sites, newspapers in numerous States and honored on the WWW as photo of the week by other photographers. People always ask me what my equipment is. I shoot with two Canon professional bodies and my lenses are only the best L-glass Canon makes. It’s the same equipment you see on the sidelines of the NFL. Please remember you can ALWAYS contact me through email or just grab me at a game if you have a special request. I’ll do my best to get your shot. I also do Senior and family outdoor portraits, team and action photography for all sports, event photography & real estate photography. Please contact me if you are interested. There’s no we or us in my business. You get me and only me. *I* cannot count on anyone other than myself to get the job done with the same care and experience I have.